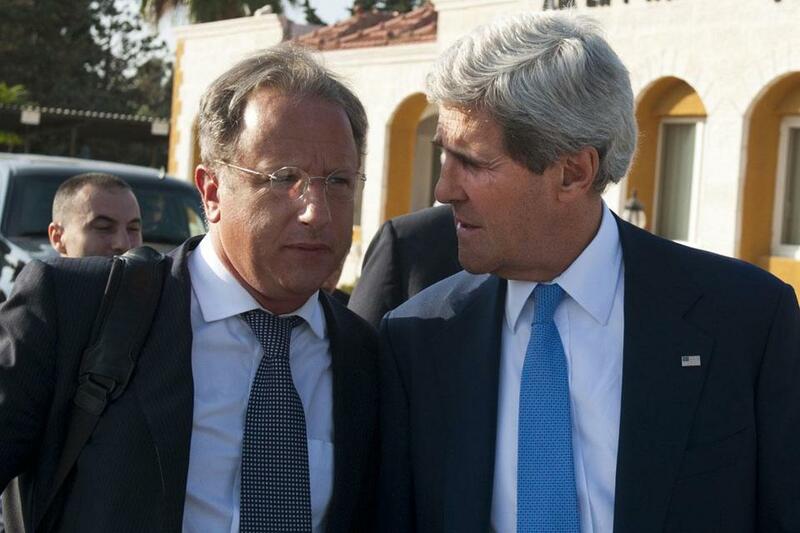 Frank Lowenstein (left) worked for John Kerry in the Senate and on his ’04 presidential bid. WASHINGTON — The State Department’s would-be arms control chief, Plymouth native Frank Rose, was once John Kerry’s 17-year-old intern. Harvard Kennedy School scholar Sarah Sewell, who was first enlisted for his 2004 presidential run, has been nominated to take the reins of human rights policy. From the agency’s chief of staff to its Mideast peace envoy, the new secretary of state has filled the top rungs of the State Department with numerous advisers from his 30-year political career in Massachusetts, according to a review of his six-month tenure. Secretaries of state have always had leeway to name their own top officials, but Kerry, like Hillary Rodham Clinton before him, is one of the few politicians to hold the top diplomatic post in modern times. That gives him a deep network of loyal political supporters and experts to take on leadership positions. While enlisting many familiar faces from policy circles, Kerry has also frequently promoted from the career ranks of the Foreign Service and elevated more women to senior posts, according to his supporters in the department. “John Kerry’s unique imprint on the State Department is beginning to become apparent,” said a top adviser not authorized to speak publicly. Kerry is relying heavily on an army of trusted hands to delegate many of the day-to-day tasks of foreign policy — including, according to an internal tally, a full dozen aides who moved over from the Senate Foreign Relations Committee, which he chaired from 2009 to earlier this year. The vast majority of secretaries of state in recent history have been career diplomats, retired generals, academics, or have hailed from the business world. The last elected office holder to serve as the nation’s top diplomat before Clinton was Edmund Muskie, a Democratic senator from Maine, more than 30 years ago. And he served for less than a year. Before Muskie it was Christian Herter, a Republican representative and governor of Massachusetts whose tenure as State Department head lasted from 1959 to 1961. It remains to be seen how total State Department employment will stack up under Kerry’s leadership. The last decades have marked a trend toward greater numbers of political versus career employees. In 1982, for example, the ratio was about 50/50. A decade later, in 1992, the share of career employees slipped to 44 percent. By 2002 it had dropped to 30 percent, and last year, before Kerry replaced Clinton, it was around 37 percent. Spokesman Alec Gerlach said that Kerry, who has had a chance to fill only a small percentage of the total positions, is placing more emphasis on career talent. Of 185 positions that have been filled under his leadership, nearly seven out of 10 have been career employees. A common refrain among the State Department staff is that Kerry “is not running the department from an enclave on the seventh floor,” said Mike McCurry, a former State Department and White House spokesman. Yet examples of selections from his political network abound. Kerry chose his chief Senate aide, David Wade, for State Department chief of staff, responsible for running the day-to-day operations of the bureaucracy . The department’s deputy chief of staff is William Danvers, who filled the role of staff director of the Senate Foreign Relations Committee and who previously held senior positions at the CIA and National Security Council. Kerry has also rehired former aides who had gone on to other jobs in the Obama administration, such as Heather Higginbottom, who had been Kerry’s legislative director from 1999 to 2004 before founding the American Security Project, a think tank inspired by Kerry. She had been serving as deputy White House budget director since 2011 before being brought on at the State Department as a senior counselor in February. Two other former aides, Melanie Nakawaga and Clare Sierawski, have also joined the department’s policy planning staff and climate change office, respectively. Those familiar with Kerry’s thinking say it is all part of a broader objective. “His goal hasn’t been to reward friends, but to have a staff around him that can execute on an array of policy priorities and steer the ship of State when he’s traveling and must, by necessity, delegate authority,” said another State Department official who was not authorized to speak publicly. Kerry has relied on some of them to play highly sensitive roles, including Frank Lowenstein, who worked for Kerry in the Senate and on his 2004 presidential bid, and played a critical part in jump-starting peace talks last month between the Israelis and Palestinians. Some more recent additions to the top tier of the department include arms control expert Rose, who worked in Kerry’s Senate office before leaving for the State Department in 2009. If confirmed by the Senate, Rose would be the first African-American to hold the post of assistant secretary of state for arms control, verification, and compliance. Meanwhile, Harvard’s Sewell, who is in line to be undersecretary of state for civilian security, democracy, and human rights, would become the third female undersecretary out of four — the highest ratio ever. Six of the 10 assistant secretaries are also women, according to a State Department personnel list. “He is very good about setting new places at the table for new faces, more so than his predecessor,” McCurry said of Kerry.